Cassandra Kahle and Blue. Photo by Ric Shaffer Photography. Gladstone, NJ. 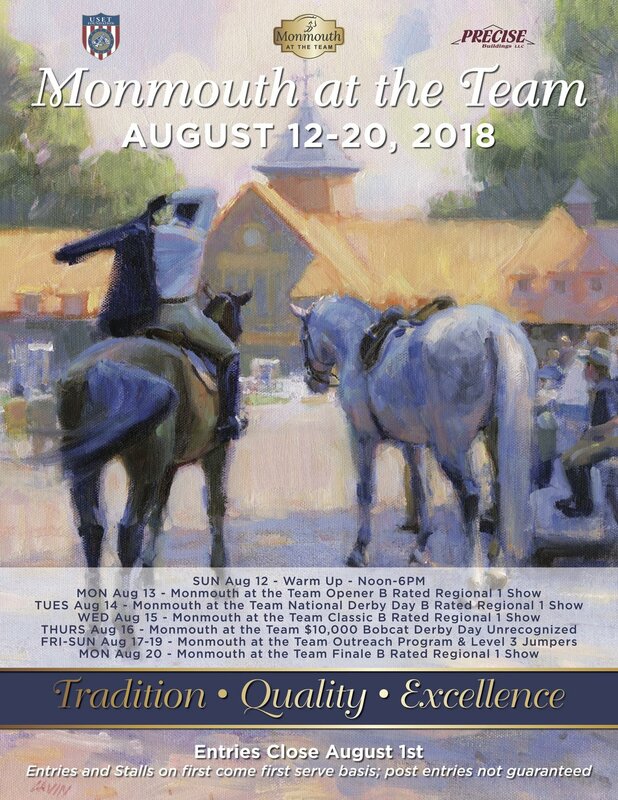 – June 6, 2018 – The prize list is now online for Monmouth at the Team, presented by Precise Buildings. The hunter/jumper event is scheduled for Aug. 13–20 and this year includes an additional full day of equitation and children’s hunter competition Monday, Aug. 20. Schooling starts at noon Sunday, Aug. 12. Founded in 1895 and formerly known as the Monmouth County Horse Show, the event moved in 2016 to historic Hamilton Farm, the U.S. Equestrian Team Foundation Headquarters in Gladstone, New Jersey. Monmouth at the Team is an opportunity for area competitors to enjoy superb hospitality and footing at a beautiful, iconic, world-class facility. Exhibitors give rave reviews for this exceptional horse show. Click on the cover to download the prize list. The view from the hospitality tent at Monmouth at the Team. Photo by Ric Shaffer Photography. Monmouth at the Team is proud to offer the ultimate in hospitality, thanks to the generous sponsorship of Missy Luczak-Smith. Gather with friends and enjoy the competition from an ideal vantage point. Chive and Thyme Catering will serve gourmet fare starting at noon Sunday. Join us each morning at 7 a.m. for continental breakfast. Snacks, lemonade and iced tea will be available all day. Savor light appetizers with beer, wine and Tito's cocktails each day, followed by substantial appetizers at 5 p.m. Saturday and Sunday, enjoy a sumptuous brunch served at 9:30 a.m. Afternoon parties with live music Thursday-Sunday add to the ambiance and fun of this unique show. Reserve your table today or contact Leslie Sullivan at leslie.sllvn@gmail.com. Boutique shopping at Monmouth at the Team offers something for everyone. Vendors should reserve now as only a few spots remain. Monmouth at the Team welcomes new sponsor Dover Saddlery. Dover Saddlery offers quality products, outfitting both horse and rider for any level of competition and riding. We look forward to seeing you at Monmouth at the Team!